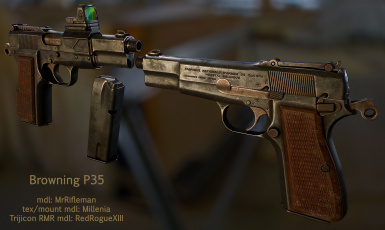 A professional quality, scratch-made Browning P35 with 3 in-game attachments, custom sounds, complete leveled list integration and an optional vanilla 9mm pistol replacer .esp. If you're getting crashes when applying weapon mods, install Pelinor's Weapon Mod Menu from here. Want to learn how to make weapons like me? I made a tutorial series in June, check it out here! 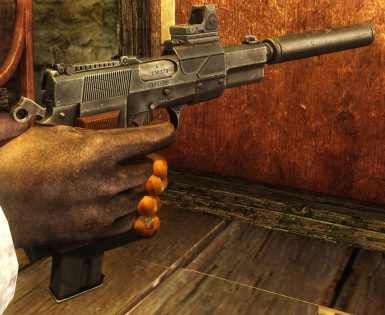 This mod adds in a Browning Hi-Power M1935 with three modifications - an extended magazine, a silencer, and a holographic sight. It comes with unique static and sound entries (and custom sounds! 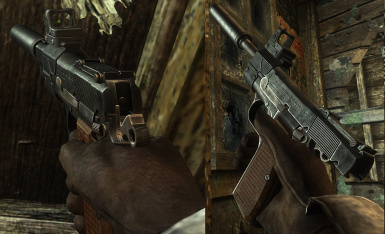 ), as well as having it added to the appropriate perk lists, holdout lists, repair lists, weapon lists, and leveled lists. It can be found by Doc Mitchell's chair in his bedroom. This mod should not conflict with any other mod. It will, however, overwrite some files from other weapon releases we have done in the past should you have downloaded and installed them. Let it. 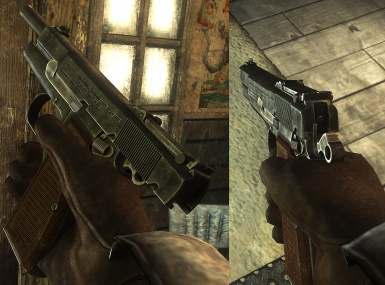 * The icons are placeholders as per usual, but once they are made they are drop n' play without a mod/esp update. * The replacer .esp might be janky and will probably conflict with WMX/WME. It's provided as-is as I have no time or motivation to do compatibility .esps, but if you do wish to improve upon it, feel free to. Copy/extract the archive into your Data folder and check the esp off in your data loader. Do not edit or redistribute without explicit permission from Mr. Rifleman, RedRogueXIII, and Millenia.